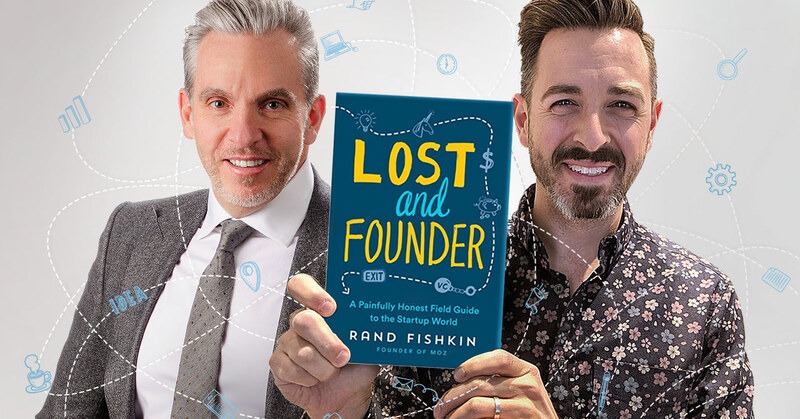 Rand Fishkin, the Wizard of Moz—recently turned Sorcerer of SparkToro—joins George to talk about his new start-up and the release of his upcoming book, Lost and Founder. From his personal and professional struggles in entrepreneurship to his advice for sales and marketing leaders, learn how to avoid the most common start-up mistakes and conquer your challenges with hard-won insights. Lost and Founder is available for preorder on Amazon. Clip: Does Rand Fishkin think the ‘local business’ is dying? Welcome to the next edition of the Conquer Local Podcast. This week, I’m excited to sit down with Rand Fishkin. We’re talking about his experience growing his startup turned multi-million dollar company Moz and what he learned as an entrepreneur and CEO. And it’s not just the happy stuff. We’re also going to find out what Rand’s view of local is in the future of local business. And I’m really looking forward to talking with him about his recent exit from Moz and his new company SparkToro. He’s got a bunch of advice he’s going to give our listeners as they improve their sales strategies. All this and more coming up next with Rand Fishkin on the Conquer Local Podcast. George: Rand Fishkin joining me on the podcast this week, SEO legend, founder of Moz, and now the CEO of SparkToro, and he is the author of the new book “Lost and Founder.” It comes out on April 24th. And I’m thrilled to have Rand on the podcast today. Rand, we’ve got some tough questions for you, so get ready. Rand: Awesome. I love it, George. Thank you for having me. George: Let’s talk about the book “Lost and Founder,” and I have it right here. It’s a great read. What was the catalyst to writing that book? Rand: Yeah. So the book is coming out April 24th as you pointed out. It’s in pre-orders now. And the catalyst for the book was really all these experiences, which I’m sure you’ve had too, right, where you go out for a coffee, or beer, or breakfast with another founder of a company, and you have that heart to heart talk about how hard this stuff really is, and how everything that you hear as, you know, sort of common wisdom and what’s, you know, a best practice turns out to be immensely misleading and frustrating. You know, the classic Silicon Valley tale of Facebook, Uber, Airbnb, you know, Salesforce, what we’re supposed to be building, what we’re supposed to be doing, the footsteps that we’re supposed to be following in, those really frustrate folks. And so this book is a let’s go out for a beer together, you know, you and I, and granted in this particular session of beer, I’m gonna be doing most of the talking, but hopefully, these are the same questions that you’ve got. George: You know, it’s interesting you mentioned that there are, you know, the Facebooks, and the Googles, and the Ubers, and we could list out another 10 or 15 of them. There’s only so many unicorns, there’s all these other companies that have challenges. So if you’re gonna follow what the unicorns did, there’s probably a lot of luck, there was a lot of timing, you should question all those things. Rand: Absolutely. Yeah. I mean it’s basically a I made all these mistakes. Please don’t make exactly these same ones. George: What I’ve been fighting against since I arrived at a tech company six years ago and became the chief revenue officer, is that everybody’s looking for this magic pill and this silver bullet that we can put into the gun, and we could train thousands of people to follow. And there is no silver bullet, and there is no magic potion at the end of the day. George: I love that you use mythology. Thank you. Rand: Yeah, yeah. Even some of the most famous examples of growth hacks didn’t actually work the way we think they do or that they did. But it’s also the case that a hack finding culture around marketing can take a lot of the wind out of the sails of an organization that if they focused on building a flywheel, right, and getting each revolution right and optimizing each little piece or remove some friction from that flywheel so that it gets going faster and faster, they would actually have vastly more success than the, you know, four-year journey to find that one growth hack that works for six months and then doesn’t work at all. George: Well, you led me to a question that I have, and that is around the $1. So there’s a point in your book where you talk about you offered Moz for $1 to the first 5,000 people, but that didn’t turn out the way that you expected it to. Can you elaborate on that? Rand: Yeah. So in a way, right, one part of it worked very well. And that was we did get a tremendous number of people, I think almost exactly 5,000 people, signing up for that one try Moz for a dollar offer. What sucked about it and what I talked about in the book is that that offer did not improve the product. It didn’t make it a better match for customers. It wasn’t doing a better job of targeting right customers. It was just broadening the audience and getting a bunch of people into our funnel who over the next, you know, year and a half had much worse churn characteristics, much worse lifetime value, and didn’t find the product as compelling as the people who signed up for it organically. And worse still, we didn’t realize that until probably a year or two in. And so after seeing that, you know, the success of that growth hack, we kept chasing another hack, another hack. “Oh, what kind of discount can we offer? What kind of promotion can we offer? What can we do to get another 5,000 people to give Moz a try? Oh, what about this? We’ll do…we’ll make a free trial, you know, for 30 days.” A lot of stuff that did not end up having positive impacts on our marketing, and certainly didn’t help make the product a better fit for the customers who were trying it. George: Well, when I read that, it was really interesting because I believe this to be a challenge for all organizations. I’ve fallen into it a number of times myself. I actually have done it in the last 12 months. But you have to hit plan. Businesses have a tendency to pour morphine on a problem. So they go out and they run ads and they sell stuff at discounted prices. You should really look deeper than just putting the morphine on the problem. Rand: Well, and I like your analogy of morphine because you do grow an addiction to it as a marketing organization, right? And then you need another hit of it next time, another hit of it next time as opposed to, you know, finding true, consistent improvement. George: You said in your blog that if leaving Moz was on a scale of 1 to 10, a 10 being a limo came and picked you up and they took you off and fireworks and that, and then a 1 was escorted out by the police, this was like a 4. So can we talk about that a little bit? Rand: I said escorted out by security. George: Okay, security. Sorry. I wanna make sure that I get the quote right. Rand: That’s even worse. That must be a negative one. George: Well, that was actually one of my exits was the police, but we won’t get into that on this episode. Rand: All right. Well, I look forward to hearing about that. I would say that the departure, you know, I’m not going to get into a ton of details. I actually love to be very transparent about this kind of stuff, but this is one of those few times when I don’t…let’s see. I would say, I don’t feel comfortable, and also, you know, leadership at Moz asked me not to be and I said that I would. So the basic story is just a lot of professional conflict that I had with the, you know, with leadership there over the last few years intensified, that turned into some personal conflict, which turned into more professional conflict, which meant that I was leaving. And you know, I still have a ton of friends there that I absolutely love. In fact, right before our podcast, I was on a meeting with a team that’s working on a new very exciting product there, you know, that I’ve been advising and helping on. I ran an acquisition process to acquire the team that’s building that. And so, you know, love that team. My wife and I own 24% of Moz still, I’m still the chairman of the board. So there’s lots of positives things that still go on between me and Moz, but this particular departure, not fun, you know, not a great experience. George: Yeah. You know, most of the time they’re departures for a reason and sometimes they’re just not right. I will tell you, I am a subscriber, and I utilized the service on an ongoing basis and find a lot of value from it. So we wish you well with your 24% and hope that it continues to pay you nice dividends. George: Can you give me the elevator pitch for SparkToro? Rand: Sure. Yeah. I think it’s insanely infuriatingly hard for marketers, and entrepreneurs, and organizations of all kinds to identify the publications and people that actually influence their audience and earn engagement. That’s a process that takes oftentimes weeks or months of work and tens of thousands of dollars from a PR company to do a survey, and you know, do a bunch of manual research. I don’t think it should work that way. I think you should be able to go to a search engine, type in interior decorators and see all the publications, and podcasts, and YouTube channels, and people, and events that they follow and engage with, and filter that data by the things that you need and build a list of those folks so that you can go out and do the right kinds of marketing to them. George: Wow. So where do we sign up? George: We have a bunch of people that subscribe to the podcast all over the world. We’re very happy with the growth that we’re having to this. The reason why we got into starting Conquer Local was myself working with sales organizations and helping them to understand that you need to become a sales professional rather than a salesperson in 2018. You did say something in the book though that I have to call out being a salesperson. And I’m not quoting verbatim, but you said here on page 102 that you loathe the direct sales. Can we get into that a little bit? Rand: Yeah, absolutely. So let me give you an example. Right now I’m in the process of doing an Angel fundraising round for my new company and it’s like the… it’s the worst feeling in the world that I have. I absolutely despise the awkwardness and the embarrassingness of reaching out to the folks that I know who, you know, who like me and trust me, we’ve had a relationship for a long time and saying like, “Hey, will you back my next thing?” It is all about my discomfort, right, and my bias against that. And I have actually found something, I bet you have to, which is oftentimes the most shameless salespeople are not the best ones. It’s often the ones who are self-aware, and humble, and feel the discomfort of the awkward relationship that happens when one person is trying to sell another person something else that actually those folks do very, very well because there’s an authenticity, a humanity, an emotional connection that bridges the temporary awkwardness of the reason the relationship exists to form a deeper kind of connection. And I think that that’s not necessarily a bad thing. But I do wanna go back. So it’s the Angel round, you’re trying to get the funding, you talk a lot about getting funding in here, which, you know, you were successful in arranging funding, which is never easy. I’m wondering how do you deal with the rejection? Because the rejection is the thing in sales, it’s the hardest thing to get over. And I bet you it’s happening right now. Rand: Oh, yeah, yeah, absolutely. The two or three biggest things that I’ve learned on the Angel side, for example, when I get nos are, well, oftentimes I assumed someone had income or wealth that they did not actually have. The second big one was that there was some, you know, some structure, some reason why it wasn’t a match. And that helped me identify who are wrong customers in the future and who are right customers now. George: Let’s get into the entrepreneurial struggle portion of the book. It was the one piece that really spoke to me because I’ve been an entrepreneur. You know, and you get into the, you know, the dark moments. There were moments where I was like, “Oh, wow, what is it, 2007 where I was feeling exactly.” You even talked about depression, and I was like, “Wow, finally someone is calling this out.” Because it’s not always a bed of roses, it’s not always having Ashton Kutcher be you in a movie of Steve Jobs. It’s not like that. And it’s not just this hockey stick growth up into the right. It is a struggle and a battle. And some people have called it the long slow ramp of death. Rand: I think that one of the problems that I have in…I think maybe this is less true in Canada, but I think certainly in the United States there is a hyper-masculinity centric culture in the startup world, especially the tech startup world, and the venture-backed startup world that says, “You are only ever strong, aggressive, you know, crushing it,” which I despise. There is no room for weakness. There is no room for vulnerability. There is no room for anxiety, for mental and emotional struggles, for depression. These things are considered unacceptable for leaders to have. Considered not the qualities that, you know, a startup or a funded entrepreneur is allowed to talk about, to be open about. And I think that’s crap. I think that actually makes it harder for folks who do experience these issues, which is almost everyone, which is almost everyone to be able to do their job well. I hate that. The death of the local business? George: We have a lot of people that listen to the podcast that call on local businesses. And you know, some people are writing in blogs and stories that the local businessperson is an endangered species, that we’re being Starbucked and Amazoned to death and…you know, I think there’s always gonna be this local thing that we need. Amazon’s not going to deliver a dog groomer to you with a drone. That’s just not gonna happen. I’m gonna wanna go to a dog groomer. There’s going to be a local business component. I don’t see that going away in our lifetime. But I guess where I want to go with this is, you know, you built a company that helps local businesses with one of their biggest problems. Give me some suggestions that you would have for all of the entrepreneurs and the local business people out there of maybe just some things that they could do to make the marketing of their business better. Rand: Yeah, sure. So I want to address the first thing, that macroeconomic issue that you brought up. Obviously at Moz, at the board level, we pay a lot of attention to that. And one of the things that we uncovered in our research is that essentially it is not the case that small local businesses are dying. It is very much the case that local-centric, national and regional chains are struggling and many of them are closing. So when you see like, you know, the death of the local business, think “Man, Sears is having it rough. Boy, Macy’s is having it rough.” Those are the kinds of businesses who are…Toys “R” Us, right? Those are the kinds of local businesses that are really struggling. I don’t see in the macroeconomic data, you know, the dog groomer, the car repair shop, the yoga studio. Those seem to actually be doing just fine. I would say, you know, if we wanna get to the tactical side, right, how would I think strategically about that? And you know, we saw this at Moz, but I think that the ability to target businesses in one size fits all format, that fails really fast when you have, well, we have four local bookstores in our area, but the Barnes & Noble is out of business. Well, there’s three hobby and toy shops around town, but the Toys “R” Us is gone. And one size fits all much less for those individuals. And that’s where I think that crafting a strategy that takes into account the differences and the uniquenesses of those businesses, and you know, treats them as individuals, has some degree of research into those individuals and those individual businesses before you reach out and sort of put them into your singular funnel that’s designed to scale tends to work much better. George: You know, when we look at that becoming a trusted local expert, people would say, “Rand Fishkin is an expert.” And you’ve done a heck of a job of building a brand around your name. And I’ve noticed you spend time responding to strangers on Twitter and you’ve built this community. Can we talk about that because I think there’s an incredible lesson here for the thousands of digital marketing experts, sales professionals that are tuned into this edition of the Conquer Local Podcasts? What advice could you give them as they move down that quest to be the trusted local experts? Rand: Yeah. Very early in my career, I struggled immensely with SEO. I was a web designer, right? I was building websites for local small businesses here in the Seattle region, and we were sub-contracting SEO and then we couldn’t afford to pay our subcontractors. Like we were literally on the edge of bankruptcy. And so I had to learn the practice myself and do it for our clients. And learning SEO was so painful and so hard that I started my own website, SEOmoz, where I sort of recorded my struggles, my failures, my attempts, what I was hearing from community folks so that I could basically share what I was learning and hopefully help other people to avoid some of those mistakes. Not dissimilar to what “Lost and Founder” is, just in a blog form around a different topic. And that desire to help people I think resonated. I think if anything built Moz’s community and my community, it’s this “Gosh, I’m struggling with this thing, other people must be struggling too. If I can help them, I bet I can help myself as well.” And that turned out to absolutely be the case. So my best advice is to find people who are experiencing pain and to help them with it. And what I took from that analogy was I needed to focus on the horizon of helping the customer because then if that was the goal, I was going to help the customer regardless of whether it was maybe I was recommending the other radio station in town because that was what the customer needed to reach their goal. You’re right, the Karma will come back. So it’s phenomenal advice. And what I love about it is it still holds true today. In fact, it’s probably more true today than it has ever been. Rand: Yeah. It works at scale in a different fashion than it ever has, right? Because when you help one person, but you help them publicly to your point, on Twitter, on LinkedIn, with a blog post, through an email, that can be amplified so much more. It can be seen by so many more people than it ever could. And when things are truly helpful, they tend to resonate. George: Now, there is two ways that we can learn and one of them is is you can learn by trial and error, or you can learn by finding people who’ve been there and learn from their struggles and their challenges. And I really appreciate you putting some of those words into this book. I also really appreciate you joining us today here on the Conquer Local Podcast, and I hope that people go out and get a copy of your book and read through it and read through some of those very hard earned lessons. You know, the school of hard knocks has a lot of graduates. And I find that you and I definitely are two of those people and I appreciate you joining us today, Rand. Thank you. Rand: Thanks for having me, George. Take care. Well, it’s a great chat we had today with Rand Fishkin. I really enjoyed speaking with him. It’s refreshing to hear his point of view as a marketer and an entrepreneur, and how his advice really aligns exactly with what we’re discovering here week after week on the podcast. And that is, you have to be honest and open to build that trust with your customers. You know, I really liked the fact that he was very candid about the building of his company, and that it wasn’t all roses, that there were a few thorns in there along the way, and how you deal with that and how you deal with the ups and downs. I think there’s some important takeaways. We’re excited to see what Rand is cooking up with SparkToro. We’re going to keep a real close eye on his new company, and we’ll keep covering that as we move forward on the weeks to come with the Conquer Local podcast. What did you think of today’s conversation? You can tweet me @GeoLeith or you can drop me a message on LinkedIn. Just search for Conquer Local. I’m looking forward to hearing from you each and every week with your feedback from the podcast. And make sure you subscribe on your favorite podcast app. The podcast does come out weekly to salespeople, managers, and entrepreneurs around the globe. We do it every week now except for last week because we were tearing it up at our conference for Conquering Local in Banff, Alberta, Canada. It was VendastaCon 2018. If you were there, you will know that it was a fantastic event. You definitely missed out. And I will make sure to bring you the date for VendastaCon 2019 as soon as it’s made available to me. Make sure you subscribe to the podcast. We are having some unbelievable guests coming up in the coming weeks. I’m really excited for the future episodes. Have a great week as always. My name is George Leith. I’ll see you when I see you.